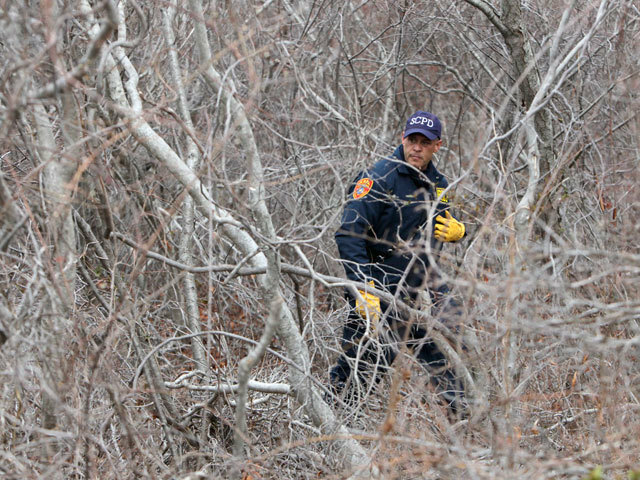 (CBS/WCBS/AP) OAK BEACH, N.Y. - The search resumed Wednesday with a flurry of activity near a remote, densely overgrown stretch of a Long Island barrier island in the investigation into a possible serial killer after eight bodies have been discovered in the area since December. PICTURES: Long Island serial killer's victims? According to CBS affiliate WCBS, about two dozen police cadets conducted a search on foot while officers using fire truck ladders and buckets got a view from the air near a residential area known as West Gilgo Beach. It was determined Tuesday that the three most recent sets of remains, which were found on April 4, were not those of New Jersey woman Shannan Gilbert, whose disappearance sparked the search that has led to the discovery of eight bodies. The recently discovered remains are in addition to the remains of a victim found last week in the area, about 45 miles east of New York City. That victim has not been identified, and police have not positively connected those remains to the bodies of four prostitutes found nearby in December. Gilbert, like the other women whose remains have been identified, advertised as a prostitute on Craigslist. She went missing in May. Police have identified the four bodies found in December as Amber Lynn Costello, 27, originally of Wilmington, N.C.; Megan Waterman, 22, of Scarborough, Maine; Maureen Brainard-Barnes, 28, of Norwich, Conn.; and Melissa Barthelemy, 24, of Buffalo, N.Y.
Police suspect a serial killer, but so far have no suspects.